The Department is going to set up a State level Museum at Sector 5 Panchkula, where the office of this Department will also be located. The matter of finalization of Architect for this museum is under process. Rare antiquities and the priceless artifacts of the collection of State Archaeology will be displayed here. The remains of ancient temple plinth of Panchayat Plan, Stone/ sculptures and architectural members of C. 8th to 12th Century A. D. have been unearthed as the result of scientific clearness work at Bhima Devi Temple, Pinjore. A site museum is set up to display the exposed artifacts. It was constructed through Haryana Tourism Corporation. With a view to educate and acquaint the general Public with their heritage of the region, a small museum has been set up at Hisar in the Jahaj Kothi, a monument of British Period. 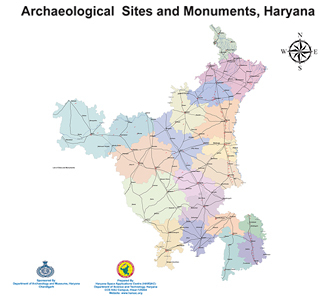 The museum displays the antiquities of popular Harappan sites like Banawali, Kunal, Rakhigarhi etc excavated by Department of Archaeology in Haryana. Jayanti Archaeological Museum has hundreds of precious articles depicting history and culture of the region. The museum was inaugurated on July 28 last year by state A.R. Kidwai. The museum started on the premises of the famous Jayanti Devi temple on the main road near Hansi -Yamuna link canal here. The temple is run by a private trust and the trust had agreed to open the museum in a building meant for religious discourses. A majority of the artifacts and antiquities in the museum are contributed by Devraj Sirohiwal and Gulshan Bhardwaj, both residents of the town. It may be recalled that Jind is a part of the 48-mile-area of Kurukshetra and is known as Jayanti located on the banks of the Drishwadi in ancient times as mentioned in Mahabharata.It is close to Rakhigarhi where relics of Harappan times were found. The museum has hundreds of pieces of art made up of terracotta, stone sculpture depicting god and goddesses, coins, pottery, chart blades, bangles, weapons and musical instruments, besides a large number of manuscripts in Sanskrit, Persian and Urdu languages. Coins of various dynasties and different types of ancient weapons are also kept in this museum. Located near the Haryana-Delhi border on the National Highway-1, the Barh Khalsa Memorial Museum was established in the memory of ninth Sikh Guru Teg Bahadur In the name of artifacts and personal belongings of the Sikh gurus, museums have only photographs giving brief references of the gurus, their families and prominent followers. According to the popular belief, after ninth Sikh Guru Guru Teg Bahadur was beheaded by Mughal emperor Aurangzeb for not converting to Islam, his head was first taken to a village, now known as Barh Khalsa, by Bhai Jaita Singh before it was taken to Anandapur Sahib for final rites. The then Chief Minister Om Prakash Chautala had laid its foundation stone on December 22, 2001. 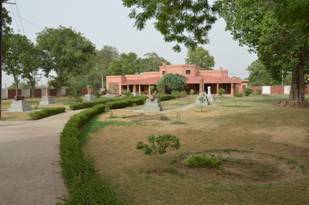 The Guru Gobind Singh Martial Art Museum is situated near the famous pilgrimage Kapal Mochan, Yamunanagar. Kapal Mochan is considered to be holy as it is believed that Guru Nanak Dev and Guru Gobind Singh had visited the place. On August 15, 2000, the then State Agricultural Minister Sh. Jaswinder Singh Sandhu had laid the foundation stone of Guru Gobind Singh Martial Art Museum at Kapal Mochan, Yamunanagar. The district administration had handed over the museum to the State Archaeology Department in June 2011. 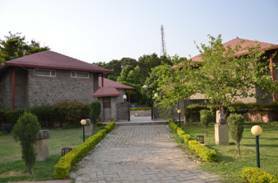 Located in Garhi Sampla on the National Highway-10, the Museum was established in the memory of Deen Bandhu Sir Chhotu Ram. Displayed materials are personal belongings of Sir Chhotu Ram Museum have some photographs giving brief references of his life, families and followers. The museum was constructed by the then Chief Minister Bhupinder Singh Huda. The museum was handing over to the Department of Archaeology on 6 September 2013.